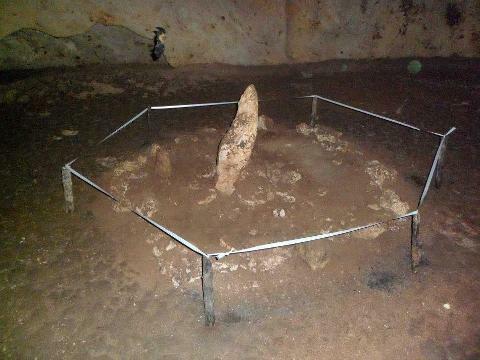 Chechem Ha Cave consists of a main chamber filled with rocks lined up which is believed to have been used for sacred Mayan rituals dating from the middle preclassic period (900-300BC) to the late classic period (700-850AD). 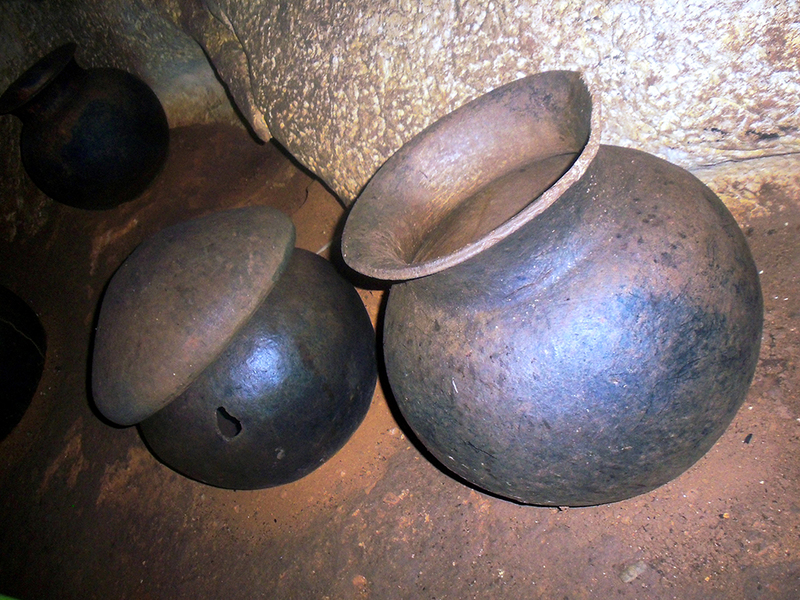 Also, there are many chambers found high up within the cave which contain many large pottery vessels which may have been used to collect 'pure water' to be used for their rituals. 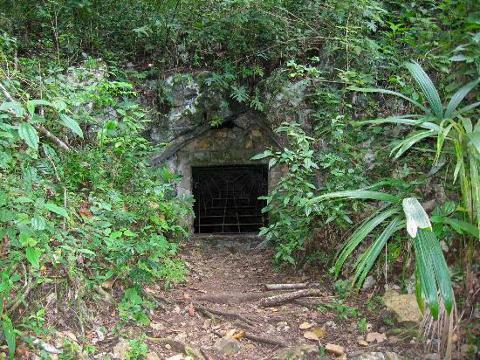 The Cave lies within a private farmland belonging to the Moralez family. One fateful day, Mr. Moralez was out on the field with his sons and dog when they stumbled upon the cave system which would change their lives forever. One story has it that they were out in search of cohune leaves (used for building thatched roofs) when they made the discovery. Another has it that their dog fell into a hole and upon jumping in to rescue him, they found it to be a sacrificial cave. 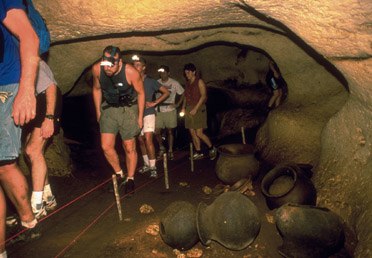 They found that the cave lead deeper inside with many broken potteries which the Ancient Maya used in their sacred ceremonies. The Maya believed that these caves were the entrance to Xibalba - the "Underworld" and that it (the underworld) encompassed 9 of the 22 layers of life which made up the world in which they lived. Here, they would leave offerings to their gods (presumably to their rain god Chaac during times of drought), sometimes even in the form of human sacrifices. One astonishing example of this can be seen at the ATM Cave where many human remains lay preserved by natural calcification, one in particular - the Crystal Maiden. Today, the site is managed by the Archaeological department of Belize and since the site is within a private property, it can only be accessed through the Moralez Family, accompanied by their resident guide. Getting There: Your adventure begins at 8:00 AM with an approx. 35 minutes’ drive which leads you through the westernmost Town of Benque Viejo, along the Arenal Road (the road the the Vaca Falls Dam), then onto a cut-off road through farmlands and onto the Moralez's farm within which the cave system lies. 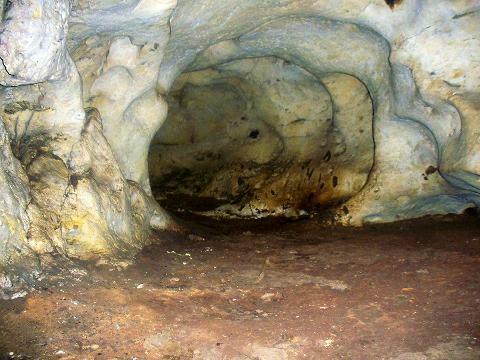 At the cave entrance: Upon reaching the Moralez's farm, you will un-board the vehicle to embark on a 45 minutes hike through the jungle trail that leads to the cave entrance. At the cave entrance, you'll notice that the mouth of the cave has been decorated with a Maya motif and has been reinforced with metal bars to keep any looters away. 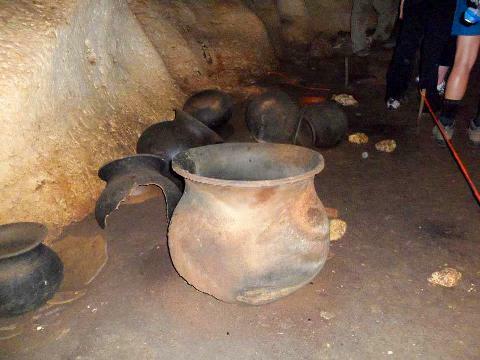 As you enter the cave you will start to see broken pieces of ancient clay pots and will also notice a change towards a fresher and more moist atmosphere. This cave is not as spectacular in terms of its formations (stalactites & stalagmites) as other caves in Belize, however; what makes this cave truly amazing is the size of the pots left behind by the Maya (some of which were used to collect water seeping through the limestone to use in their rituals), their intactness and their numbers in this cave. As you progress deeper into the cave you will come upon ladders that lead to higher chambers within the main cave system. This is where the most impressive Maya relics can be appreciated. It's amazing how upfront and close you will have these ancient relics, almost at the tip of your finger. However, you are cautioned not to touch any of these relics as they are understandably fragile and priceless. Enjoy the enchantment of this Indiana-Jones-like adventure as you explore this wonderful Ancient Maya World, a most worthwhile experience. Departure: Upon completion of your tour, you'll head back through the trail and back onto the Moralez's farm where you'll board the vehicle back through Benque Viejo Town and onto your next adventure. This is a half day tour which is best done in combination with any other half day tour such as Xunantunich, Cahal Pech, River Canoeing, Birding, among others. What to Bring: Sneakers with good traction or hiking boots, preferably long trouser pants, hat, camera, water. Note: This tour is not for persons with disabilities, heart conditions, back or leg problems, or claustrophobia. All guests must be in good physical conditions & able to walk in a jungle setting.